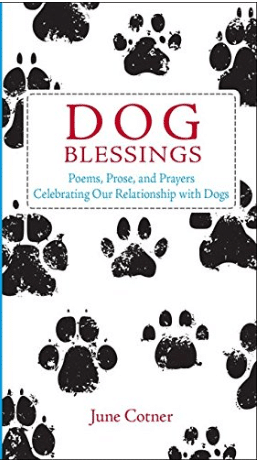 June Cotner is the author of twenty-seven books, including the bestselling Graces, Bedside Prayers, and Dog Blessings. Her books altogether have sold nearly one million copies. She has been featured in many national publications including USA Today, Better Homes & Gardens, Woman’s Day and Family Circle and regularly appears on television and radio. June’s latest love and avocation is giving presentations on Adopting Prisoner-Trained Shelter Dogs. In May 2011, she adopted Indy, a chocolate lab/Doberman mix (a LabraDobie), from the Freedom Tails program at Stafford Creek Corrections Center in Aberdeen, Washington. June works with Indy daily to build on the wonderful obedience skills he mastered in the program. Why June was inspired to write her book, Dog Blessings, and how it can profoundly impact your own relationships with your furrkids. About the largest Blessing of the Animals service at The Cathedral Church of St. John the Divine in New York City. How our prison systems are helping to create a win-win-win situation for many dogs who would otherwise be euthanized. (Freedom Tails Program) Hundreds of thousands of dogs are saved each year by this program. How June’s own dog adoption from the Freedom Tails Program (Indy) is working out. Her experience with the program has proven to be exceptional! Learn what commands a dog masters in the Freedom Tails Program, making the transition into a home easier. For more information about Dog Blessings and June’s work, please visit her at http://www.junecotner.com.